Admitting to being "strangely jittery" because Browning's "masterpiece" The Unknown is not his own movie, Guy Maddin rationalized that maybe it was because he would be translating the print's French intertitles "on the fly." "Actually, I have to confess," he qualified, "What you're getting tonight isn't even a translation of the French intertitles. It's an untranslation. I want to mention this because it's just the original English intertitles being read by me while you're translating the French ones. Every now and then—if you have a little French, or even if you don't—you'll notice that there's way more words on the intertitles than I'm saying. I just want you to be confident that I'm not doing my own editing. Anyway, that's another matter. "While I have a huge and friendly audience, I'm really tempted to preach to the converted because, well, there's no risk in it. Please allow me to say a few kind words on behalf of melodrama. Melodrama—outside of the enchanted walls of the Castro Theatre these past three days, as it has been for a long time—is often greeted with cringes or derision; but, really good melodrama, I think, is as fine an art form as there is. Let me say why. "During our waking hours—which, are now, but they're getting sort of crepuscular; they're getting pretty nocturnal here—but, during our waking hours, during daylight, we must behave, right? If we see someone we lust after, we're not always just allowed to grab him or her. If we see someone we hate, we're discouraged from punching them. If we're feeling sad, it's frowned upon to wail and weep openly. We all have to comport ourselves in kind of a repressed state. Such are our sad waking hours. "But, in our dreams, at night when we sleep in our dreams we are liberated. Our selves, our story selves, are liberated. Our ids are loosed upon our little dreamscapes and—if we're lucky—we get to grab the person we lust after; we get to hit the person we hate; we get to wail and scream and moan all we want without anyone scolding us and, also, we're given access. Little repressed fears and anxieties grow into monstrous terrors in our dreams and our true selves become so uninhibited. I use the word 'uninhibited' pointedly because melodrama is always aligned as something sort of grotesque or a tasteless exaggeration of real life. If that's all melodrama were, it would deserve that slag; but, I think a melodrama isn't a true life exaggerated—that would be bogus—it's true life uninhibited, just like our dreams. "There's nothing more truly crazily uninhibited than a Lon Chaney / Tod Browning collaboration. When I see one of Lon Chaney's little allegories of dismemberment, I am Lon Chaney. He seems to remove just about every member except, well, there's one that never gets removed and that's always meant to drive a plot. 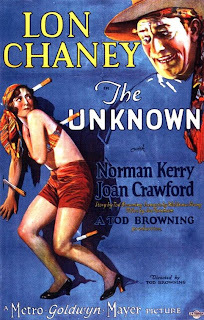 So I'm hoping you'll all identify with Lon and Tod and that sole surviving member and me tonight while I narrate and bring to you—along with the rest of the San Francisco Silent Film Festival—Tod Browning's The Unknown!" Yay! Thanks for that Mr. Maya! KIYOSHI KUROSAWA BLOGATHON—In His Own Words…. Cinema Studies vs. Cultural Studies?